In K?cracy, Trees in the Storm and Other Poems, Bill Ndi vociferously bemoans the fate of a world in which the good and the evil are intimate bedfellows; a world wherein miscreants proceed with nauseating impunity to trample on innocence. The poet, a widely traveled scholar in Africa, Europe, and the Americas, currently resides in Australia where he is hailed as an Ambassador of the Peace. 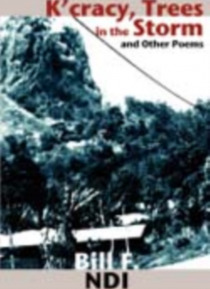 Informe… d by his experience as a child of the world - being at home away from home and thinking of home, Bill Ndi serves the reader with a delicious platter of poetic maze which to him is synonymous to the political maze he has known around the world.